Enabling The Art of The Impossible – How Britain can lead the 4th Industrial Revolution. There’s a tremendous amount of focus being applied to British manufacturing at the moment. 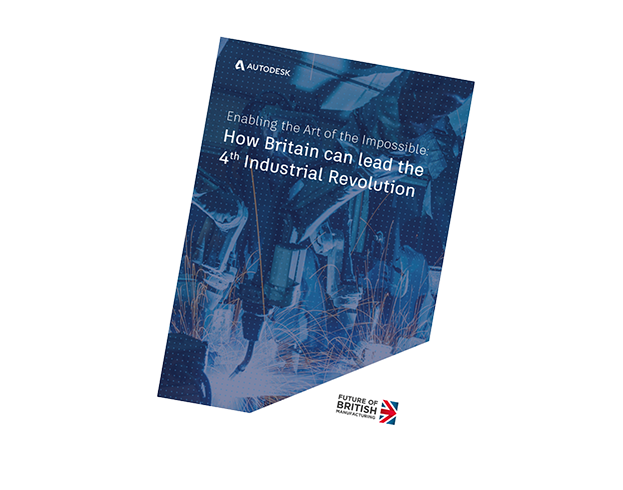 The Industrial Strategy White Paper and the Made Smarter Review both identify the benefits of digitalisation for the manufacturing industry, and offer recommendations to enable the UK to lead the 4th Industrial Revolution. It’s an exciting prospect, which we are committed to supporting. At Autodesk, we have a great deal of knowledge about the industry, so decided to add our voice to the debate through a manifesto called “Enabling The Art of The Impossible – How Britain can lead the 4th Industrial Revolution”. Developed in partnership with industry, it’s based on two core principles that we believe makes digitalisation more accessible for the largest segment of the UK manufacturing community, the SME. These core principles, are central to the Future of British Manufacturing Initiative and, if embraced, will drive what we refer to as competitive separation for the UK and enable Britain to lead the 4th Industrial Revolution. “In the era of concepts such as fully digital manufacturing processes, product-as-a-service and mass customisation, it’s clear that we can no longer afford to treat design and manufacturing as entirely separate entities, they are intrinsically linked and that link will only get stronger over time, driven by customer demand for smarter, more intelligent and longer lasting products. It’s also clear that whilst productivity is important, increasing productivity in isolation won’t yield the products that consumers are beginning to demand. “British manufactured goods are a byword for quality and innovation across the world. Through this initiative, which seamlessly drives digital creativity through process planning into tangible manufactured goods in a much shorter cycle time, we have the opportunity to leverage our reputation as a manufacturing nation to produce even more goods to sell our customers both at home and across the globe. National accounting and tax expertise with a global reach. Chairman, New Anglia Advanced Manufacturing & Engineering network.